We got home on Sunday, June 15th after exactly nine weeks on the road. We stayed in seventeen different campgrounds and drove 5,224 miles. We did have a few mishaps – a flat tire, broken microwave, and a stripped jack on the trailer. All in all, nothing serious. I read through the “journal” I kept and there were a couple of recurring themes – most of the campgrounds were nice but more importantly we had a really great time! It was a terrific trip all around! I would definitely do it again and even for longer. 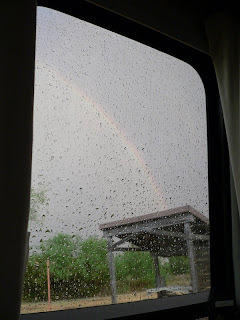 During the storm our last night in Caprock Canyon State Park, Alan spotted this full rainbow out the window of the Airstream. If I had a literary bone in my body, I would write something about following the rainbow home, but that isn’t going to happen (or it would just sound too corny.) Come to think of it, a lot of my posts are a bit corny anyway! We spent our last five nights on the road at Caprock Canyon State Park in the Texas Panhandle. It is a nice park South of Amarillo and not too far from Palo Duro, where we’ve stayed before. 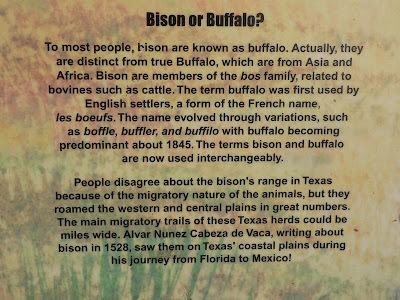 Caprock is the home of the Texas Bison Herd and we got some pictures, even though you can’t get too close. The big Bison standing alone at the trough was donated by Ted Turner. 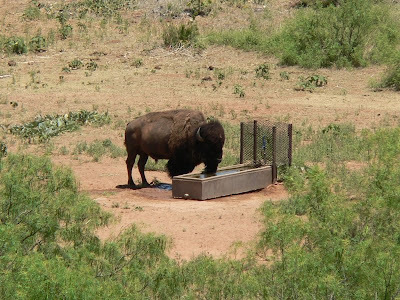 According to the Ranger, he donated three Bison to help out the diversity of the Texas Herd. These were the Bison that we spotted when we first arrived at the Park. Caprock Canyon is just outside of Quitaque (pronounced kitty-kway). It was a nice small down with around 500 residents (and a drive-in theatre.) We took one day to go on a bike ride along the local rail-trail route. We were going to ride about 20 miles round trip to check out Clarity Tunnel. It was the last operating railroad tunnel in Texas and 742 feet long. We were looking forward to seeing it, but we never made it that far! We had three flats by the time we had gone less than four miles. It turns out there were thorns all along the trail. We weren’t sure exactly what they were coming from, but they did a lot of damage. Alan ended up patching dozens of holes. Here are the last of our “vacation” photos. You can just barely see one of the Bison by my right hand and Alan is standing next to a sculpture that was installed at the Visitor Center while we were there. It was a really nice Park and the Visitor Center was practically brand new. Alan spent two days fishing at the nice pond in the Park. He caught a couple of bass. It was the only time he got to fish on our whole trip! I thoroughly enjoyed getting to sew. It was a little windy, but I did some cutting inside and I had things pretty well organized to use my machine outside. We made it back home today and were grateful to find that everything was fine with the house. Our neighbors did a great job keeping an eye on everything. We spent the last week at Caprock Canyon State Park (in Texas). I have a few things to get done and then I’ll post pictures from our last week. Thanks to Alan being such a trooper and being willing to drive me and sit in the car, I’ve had the opportunity to visit dozens of Quilt Shops while we were on this trip. I started with a plan to buy one fat quarter from each each shop for my Sunny Southwest quilt. Of course, I found other things that were worth buying. I’m done now. I thought I would take a little inventory of what I’ve bought and get things organized. This is one of the earlier things I bought (obviously when we were in Tucson.) The pattern had a cool short cut for making the blocks that made the whole thing go together quick. I may just bring this on Retreat, if I can find a decent background fabric in my stash. This is a photo of the border fabric I bought here in Albuquerque along with all of the fat quarters. It is going to take a bit of work to turn this into a decent quilt, but I have a patter that I think will work – you just sash each of the fat quarter fabrics with one of a few repeating solids to tie everything together. Alan thought this pattern was the ugliest thing he had ever seen:) I think it is really great and will make a nice wall hanging for my foyer. I bought these silk screened squares and the fabric to make a Table Runner or maybe a Wall Hanging. I thought the colors went well with my house and they had a pretty sample in the Quilt Shop. Today we took the Tram to the top of the Sandia Mountains and hiked the South Crest and La Luz Trails. We only walked about five miles, but it was pretty diverse and there were a few interesting milestones – like the Kiwanis Cabin and the Sandia Crest (10,678 feet). The Kiwanis Cabin was pretty cool. It was built buy the CCC (Civilian Conservation Corp.) in the 1930’s. We’ve seen a lot of CCC work in all of the State and National Parks we’ve visited. They also built a lot of the Trails. The interesting thing is that when you see photos of the CCC men (and boys), they are often smiling. You didn’t usually see people smiling in photos back then, but I guess these guys were just really happy to be working and have a job. The Tram ride was pretty cool and the views from the top were pretty awesome (including the antennas at the Crest). It is supposedly the longest tram and it has only two towers. We’re going to have to start hunting down Trams all around the country to visit! Maybe we’ll get to see more maintenance guys riding on the top of the Tram on the way down! We’re off tomorrow to our last stop – Caprock State Park. I’m sure we won’t have Internet access there, so this will probably be my last post until we get home. Oh, by the way, did I mention that we also went to CostCo today? We couldn’t make it nine whole weeks without going in a CostCo. There wasn’t much to buy, except lunch meat and bottled water. We don’t really have the room for any other bulk items – they’ll have to wait until we’re home. Today we spent the day doing more of the regular tourist things – we went to the Atomic Museum (which was really pretty good – better than expected) and the Aquarium/Botanical Gardens. 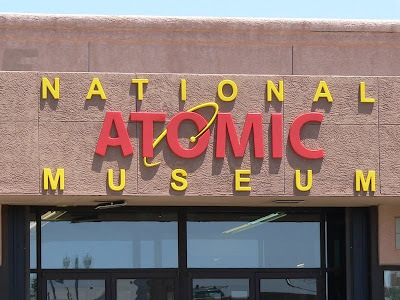 The Atomic Museum used to be on the local Air Force Base but they had to move it after 9-11. Everything is kind of squeezed into a small building (they have a new building planned) and it was a little hard to follow some of the historical things. Overall, Alan and I both thought it was interesting. I do have do some research though, there was an old postcard that had “Paducah” the Atomic City – but no explanation for why. For all you quilters out there – you know that Paducah is now practically known as “Quilt City”. After that, even though it was pretty hot (and a Sunday – not the best day for Aquariums) we headed to the Aquarium and Botanical Gardens. The Aquarium was a bit of a disappointment. 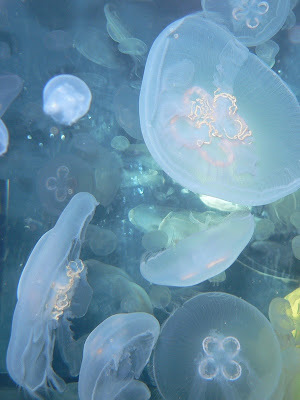 They had only a couple dozen tanks with all of the regulars – sharks, jelly fish, manta rays, Koi (that was a new one – probably a tie in with the Japanese Garden in the Botanical Gardens next door). The eel exhibit was probably the best – you walked through a tunnel with eels tucked into the walls on both sides. 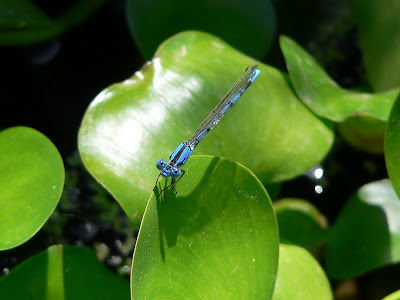 The botanical gardens were nice but unfortunately the big draw, the butterfly and hummingbird exhibit, wasn’t open yet. The Japanese Gardens were very nice and there was a really fun Children’s Garden with a giant pumpkin and very large insect sculptures. 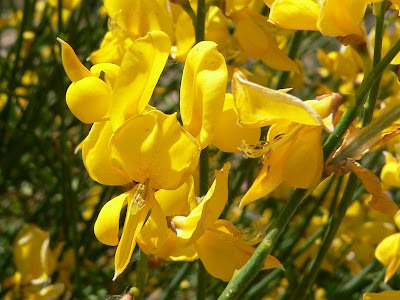 I especially enjoyed the rose gardens – they were all in bloom and smelled terrific. I’ve loaded a bunch of photos into Photobucket as a test to see if I can get them linked here. It looks a little crude, but just try clicking on “View All Images” and see what you get. Let me know if it doesn’t work! We’ve booked our last campground stay at Caprock State Park in Texas starting on Tuesday. We’ll stay there for five nights and then make the drive home on Friday. It will mean two long days of driving (from Albuquerque and from Caprock.) Since our first day out, I don’t think we’ve driven more than three or four hours on any one day. I can’t say that I’m really ready to head home, but we had planned on being out for two months and this will get us home at exactly nine weeks. I am looking forward to seeing my friends and getting back into my sewing room. I have plenty of projects backed up now!